After two days of qualifiers, the Men’s Pairs and Women’s Groups have their final today. And oh Gymba, what a final it was! We’ve heard the Russian Anthem twice as both medals topped up Russia’s medal tally. We’ve seen the Men’s Event first, the Kazakh pair performed the opening act scoring 28.530 which is almost a 0.5 point improvement compared to the same routine this morning. In the end they placed 5th in the final competition. 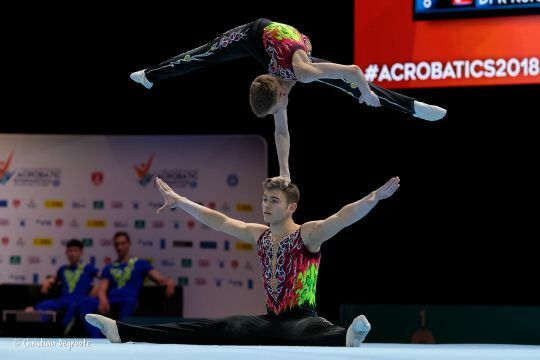 Defending Russian World Champions and World Games silver medalists Igor Mishev and Nikolay Supronov qualified for the finals from the 1st position. They had a good routine and prevented a possible fall in a dynamic element. In this morning qualifiers they scored 29.240. With 29.490 for their final routine, they beat their morning score and grabbed the gold! The biggest surprise happened in the silver medal position. Ri Hyo Song & Kong Yong Won from the Democratic People’s Republic of Korea got a massive 29.420, only 0.07 behind Russia! The medal streak continues as another Pair from North Korea had a bronze in the Men’s Pair event in Putian. Great Britain’s Adam Upcott and Charlie Tate once again rocked the audience with their Black Betty routine and improved their morning performance by 0.9 scoring 28.950. This was enough to put them in the 3rd position and secure a bronze medal. The 4th place always tastes bitter. China’s Li An & Xiang Lingzhi know that already. The pair who came 4th in Putian and 4th in the World Games had their hopes up today to finally get the medal. Unfortunately the 28.550 they scored this time was again not enough to get on the podium. Belarus got off to a shaky start but stabilized it and finished their performance without any further wobbles scoring 28.020. Artsiom Yashchanka and Aliaksei Zayats also slightly outscored themselves, by 0.1, but this time it was not enough for the podium. 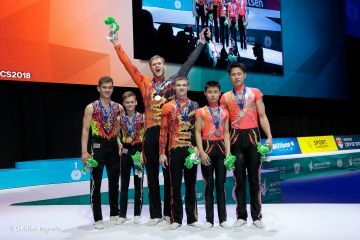 The 7th place unexpectedly turned out to be the position for the World Games Champions, Tim Sebastian and Michail Kraft. They missed an element in the dynamic combination and it cost them the penalty of 0.3 and their difficulty value was also affected as well as the execution score. Sadly they did not manage to keep up the leading streak and with 26.995 finished in the 7th position. Robin Casse and Kilian Goffaux, representing the home nation were hungry for a medal, after this morning amazing performance where they scored 29.220. Sadly a missed catch in a tempo element has buried their medal chances. They scored 26.710 and are closing the ranks of the finalists in the 8th position. Isis Coutinho, Ana Fontes and Ana Pratas from Portugal opened the second final of the day with their combined routine. They performed a clean routine and scored 0.3 more than this morning totaling to 27.570. Up to extremely strong adversaries, they finished the finals in the 7th position. The top of the podium was very crowded. Everyone managed to improve their morning score and amazing marks kept putting each performing team in the lead. Daria Chebulanka, Polina Plastinina and Kseniia Zagoskina, World Games Champions fought well for their first ever World Championship. In the final qualifying round they scored 28.610. Their routine had the highest difficulty among all contestants in the Women’s Group event - 3.010. In the finals they topped both their execution and artistry scores and with 30.060 swept the gold medal. In the 3rd place we saw China’s Duan Yushan, Ji Qiuqiong, Liu Jieyu winning bronze. 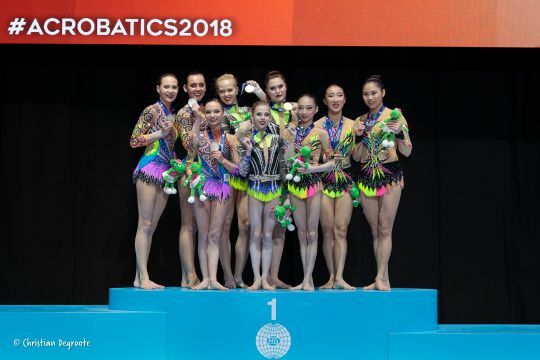 After scoring 28.240 for their combined routine in the morning, they qualified from the 4th position, but performed flawlessly in the finals and scored 29.140 which was just enough for a medal. Israel qualified from the 6th position after unlucky combined routine this morning. They didn’t have any mishaps in their final performance and scored 28.930, which this time was just not enough for a podium standing. Nonetheless, the trio performed beautifully and displayed amazing elegance so we are definitely hoping to see them again on the International stage. Ukraine who qualified from the 8th position after some mistakes in their qualifying routines, after a superb execution of the combined exercise scored 28.185 and finished 5th. Belgiums Lena de Moor, Eva Hyde & Anna Hyde, finished the qualifiers in the 3rd place, just after the leading Belarus and Russia and scored 27.440 for their combined routine in the final qualifying round. In the finals they also managed to improve that score and with 27.740 finished in the 7th position. The Women’s Group final ranking is completed by Mariska van de Water, Pleunie van Mook and Fem van Os representing the Netherlands. They qualified from the 5th position after scoring 26.820 this morning. In the finals for the same routine they have been awarded 27.300, which put them in the final, 8th position. Well done to all coaches and gymnasts!